weekend festivities…the big and small of it! This past weekend was great! The weather, my brother visiting, MM’s and my bachelor/bachelorette parties…it doesn’t get much better. My ladies’ night turned out to be a huge success…Corio’s burlesque show was amazing and all of the girls thought it was the best way to get together and enjoy some fun entertainment. I even competed in a dance-off on stage with another bachelorette, a bachelor, and a birthday girl…it was rigged and the bachelor won because his friends had very loud and obnoxious Jersey voices. We continued the night by stopping by Le Cirque to pick up a girlfriend at a birthday party. Le Cirque didn’t impress me with it’s thick carpet (how can you dance on that?!?) and annoying model agency crowd. So, we left and headed to the new club, Griffin, in PM’s old location in the Meatpacking District. Griffin had opened on Friday, so we were there on their second night being opened. They did a good job a redoing the place – nice new wood floors and a very nice chandelier affect with a mirror to reflect all of the dim lights and make the ceiling look much taller. Nick Cannon was the DJ – he’s Mariah Carey’s husband in case you have no idea who that is. I didn’t know he was DJing until Monday, and I don’t recall being overly impressed. But, I did have a good time tearing up some rug in my tutu skirt and feather head piece. MM and a few of his friends showed up at Griffin after finishing bowling with the “small man” (I still don’t know if midget is PC or not) I hired to hang out with them. Weird, I know, but MM has a fascination with the idea of a “mini-me” assistant, so I thought that would be much more fun for him than the other typical bachelor party options. Scott, the small man, was an awesome guy, and he ended up hanging out with them for nearly two hours instead of the one hour I paid for. He is a great entertainer, and you can hire him or any other entertainer from this site – clowns, characters, etc. Corio – The Best Burlesque Show in NYC! This Saturday is MM’s and my bachelor/bachelorette night! I have been struggling with the plans for us ladies…I had a nice dinner planned, but then what?!? I wasn’t into the idea of trying to hit a club right after dinner, and I also didn’t want to try to wander into a lounge or bar and have any small issues due to being unprepared – I am a seasoned event planner, so I am well aware of the “little issues” that almost always arise if you don’t preplan as much as you can. So, I did a little research and I came across Corio. The perfect solution for our ladies’ night! 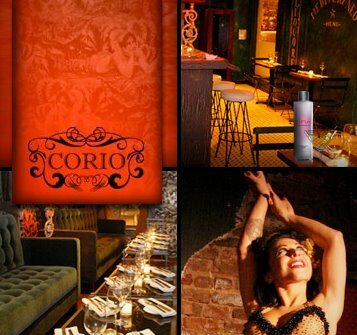 Corio is the home of “This is Burlesque!” – which is said to be the best burlesque show in the city. This Soho spot is named after the legendary burlesque performer, Anne Corio. Tickets are impossible to get, and a celebrity sighting is more normal than Bungalow 8. I broke yet another umbrella today…wait a second…I didn’t break it – the abnormally strong winds on West 34th Street did! What is it with NYC winds and umbrellas?!? I mean really! I don’t recall breaking an umbrella in any other city, but broken umbrellas flood the NYC streets like old Metro Cards on the floor of the subways. It’s a phenomenon, and I think it’s either the crazy amount of pedestrians walking the streets or really cheap umbrellas sold on every corner the second a rain cloud hits the sky. Well… problem solved…Rain or Shine is here to save us! 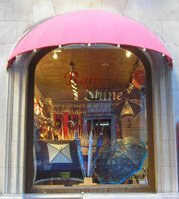 The only umbrella store in Manhattan sells umbrellas parasols, walking canes and more. With every color and style you could ever imagine, you can use your umbrella to make a stronger statement than your shoes or purse – because we all know all you see on rainy days is a wave of black umbrellas. Not only will you be saving yourself from spending $10 every time it rains on a cheap umbrella that will break one block down the road, but you will have a strong and relaible protection from the elements…and a new fashionable addition to your outfit. Stand out amongst all of those black umbrellas…this is truly one accessory that you NEED! The Gates – is this really a time for expensive exclusivity? Enter through the gold gates…on May 8th, The Gates will open in the old Biltmore Room. The owners of Naked Lunch and Gemini Lounge will be opening this lavish space and using a PR guy from nightclubs Home, Guest House and Cain to create an ultra-exclusive membership system. The servers will wear Maggie Norris corsets and pencil skirts as they serve $16 drinks. One such drink will be “the Ambassador” – naturally. There will be happy hour on Tuesday through Sunday, and they will offer bottle service in the evenings, but they will not be driven by the need to sell bottles – according to the owners. They would like the exclusive crowd to not be weighted down with things so below them. 290 Eighth Ave., nr. 25th St. This weekend was a winner as far as NYC weather was concerned. The sun was out, the air was warm, the blossoms were out, the Soho House pool was packed…it felt like summer. Keeping with this mindset, I decided it was time to find some sandals for my honeymoon in Marrakesh, Morocco and Formentera, Spain. Both of these places have that hot, raw, Mediterranean, exoticness to them, so my thought was that I would want some gladiator-inspired leather sandals and some simple yet chic sandals – maybe some with jewel flair for the evenings! When I need shoes, my favorite store to go to is Shoegasm. This store has all of the hottest trends and even many new styles that no one is wearing yet. I can always find what I am looking for, and I usually find a lot more. There are three locations, which also makes it nice if I’m heading from a different direction. My standard store is on 23rd Street between 5th and 6th Avenues. The oriental rug and comfy leather couches make me feel much more comfortable than the stark, white, blaring music shoe stores everywhere else…and a comfortable shopper is a better shopper! I got two pairs of leather sandals – one simple red pair and one black pair with some fancy beading. They’re perfect for the honeymoon, and they’re also very comfortable. AND…the best part…one pair was $29.99 and the other was $39.99! Check! 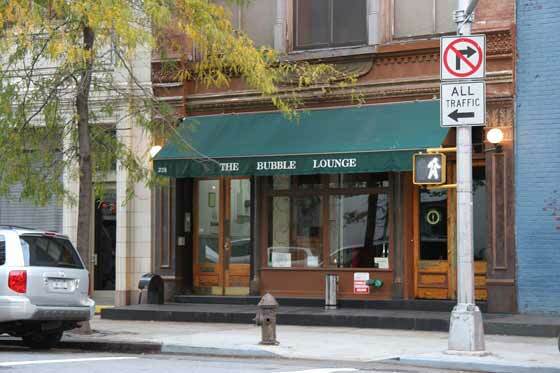 The Bubble Lounge…pop some bubbly! With over 300 Chapagnes and sparkling wines, this bar is the premier champagne salon. It is certain that you will feel a sense of refinement lounging here, which can be refreshing in the New York bar scene. However, the feeling is on line between tasteful and tacky with hundreds of backlit bottles, bubbly posters, shiny black framed pictures, and, more than anything else, the businessmen who have apparenly caught on to the fact that young females gather there. Sometimes, these men can lure a young lady to the Krug Room downstairs where couples can recline and sip their bubbly. One big positive for The Bubble Lounge is the array of plush sofas and chairs that sprawl throughout the room. It can be very hard to find a lounge with some nice and comfortable seats. Exposed brick and nigh ceilings bring more of the comfortable vibe, which is perfect for intimate conversations.